UU A Way Of Life: Book "Critical reading of Flight Behavior by Barbara Kingsolver from a Unitarian Universalist's perspective" is now available. 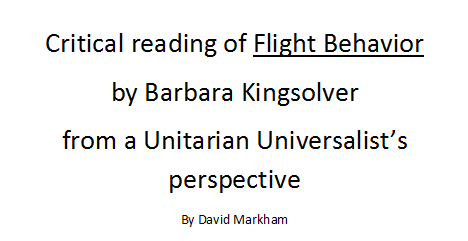 Book "Critical reading of Flight Behavior by Barbara Kingsolver from a Unitarian Universalist's perspective" is now available. There are 15 short essays in a small book of about 42 pages which are taken from the UU A Way of Life series in the month of June, 2014. PDF copies are free for the asking at davidgmarkha@gmail.com. Paperback copies will be available next week from amazon.com for $9.95. It is not necessary to have read Fight Behavior to still enjoy and benefit from the "Critical reading..." book. The book will be enjoyable and satisfying for individual use, and also lends itself very nicely to a book discussion group or a small ministry group or other kind of adult educational program.